Peggy Frezon has built a career on writing about the heartwarming benefits of animals in our lives. Her inspirational stories have been published in Guideposts, Angels on Earth, the Chicken Soup series and in her memoir, Dieting with My Dog, which was profiled here earlier by Peggy in a guest post. For anyone in need of inspiration to get into shape, Peggy and Kelly provide this in spades. In addition to Peggy's print publishing, she is also a staff writer at Be the Change for Animals and writes her own popular blog, Peggy's Pet Place. In her latest book, Heart to Heart-Hand in Paw, Peggy shares the story of her mother's challenges in trying to live a simple life in rural Vermont. After an extremely tough childhood, Luanne stumbles through many new adventures, always managing to pull herself up by the bootstraps with the help of her animal companions, many of which have surprising challenges of their own. Luanne's faith and furry family appear to help her get through everything that appears to push life's next step over the edge. This latest addition to Peggy's publishing is another inspirational, feel-good book that's a perfect choice for any animal lover. You can purchase a copy at Amazon, download a kindle version from Amazon, or win one at our #BarktoSchool Twitter Party on August 12, where Peggy and her work will be promoted. Be sure to RSVP at the link to win. 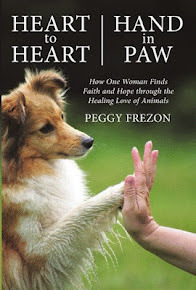 Peggy Frezon is working with Event Barkers to promote her books and blog. Hi the book sounds just like my sort of read. I will have to check it out on Amazon. Good update about book here. Thank you for this review. We are always looking for good pet related books to read and recommend. Aww. This looks like a good read. The cover is so cute. Where can I grab a copy of this book? The cover itself shows that dog are really a mans best friend. This looks so interesting and I know that this will be helpful for better dog owner.